Watch this video for advice and tips on buying and wearing contact lenses for astigmatism. If you have astigmatism, one or both of your eyes won't be completely round. This means that traditional, spherical lenses may not fit as well, making them uncomfortable to wear as the lens moves around while you wear it and means that your image isn't always as clear as it should be. Toric lenses are designed for the rugby ball shaped eyes of those with astigmatism. Because of this irregular shape, traditional spherical lenses will not fit comfortably on the eye. Toric lenses solve this problem and they stay absolutely still during wear. Some toric lenses are weighted at the bottom to prevent side-to-side rotation when you blink, keeping vision clear. 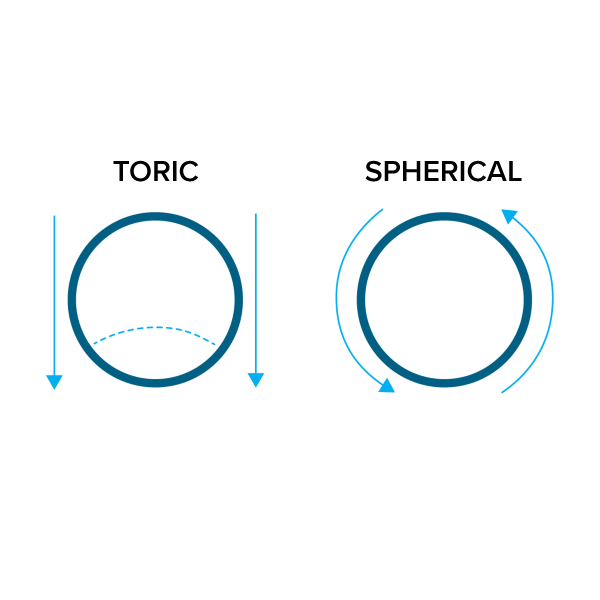 Unlike spherical lenses, toric lenses have different levels of correction in each meridian. What vision problems do toric contact lenses correct? Toric contact lenses correct astigmatism, which is a refractive error in the same category as short-sightedness or long-sightedness. Astigmatism is fairly common and causes blurry or distorted vision. This is because either your lens or cornea aren't completely spherical in shape. When light enters your eye, it's the cornea's job to bend light so that it's focused on the retina at the back of your eye. This leads to a perfectly clear image being transmitted to your brain. With astigmatism, your cornea is elongated instead of being spherical like a football and looks more like a rugby ball. This means that instead of light being focused to one place, it gets scattered across the back of the eye, making it difficult to form a clear image. As well as this, it's possible for the curvature of the eye's lens to change. 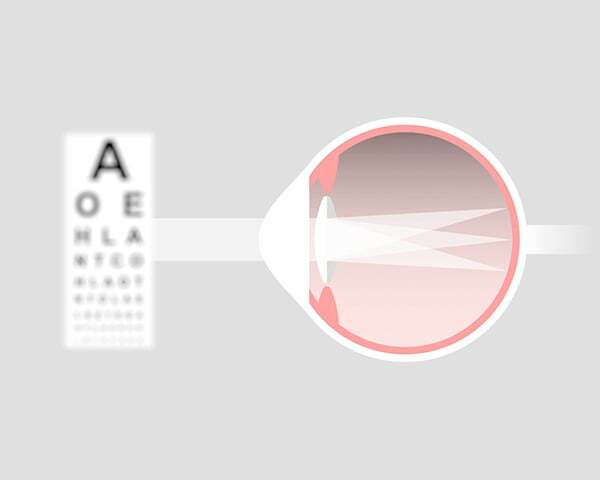 Because your lens also assists in the focusing of light, this has the same effect as when your cornea is elongated. This condition is less common and is known as lenticular astigmatism. There are 3 different types of astigmatism all of which depend on what opticians call 'meridians'. If you imagine a clock face, a meridian would be a line connecting 12 to 6 or 4 to 10, for example. These meridians are used to mark out areas of the eye, and can cause short sight (myopic astigmatism), long sight (hyperopic astigmatism), or be a combination of the two (mixed astigmatism). Astigmatism also gets classified as 'regular' or 'irregular'. Regular astigmatism refers to when your cornea is curved more in one direction than the other. This is the most common classification and is easily corrected with glasses or toric contact lenses. Irregular astigmatism is less common and is most often caused by an eye injury. Rather than being curved in one direction it can vary over multiple directions or be steeper in one part of the surface of your eye than another. Glasses rarely correct this condition and so contact lenses for astigmatism are a more suitable option. Slight astigmatism doesn't always require correction but if it results in blurry vision you may suffer from headaches, tiredness or eye strain. These symptoms are most likely to occur after performing a task that requires focusing on something for a long period of time, such as reading, driving or using a computer. If this sounds familiar to you, visit your optician. Why choose toric contact lenses? If you need contact lenses for astigmatism, then you should choose toric lenses. 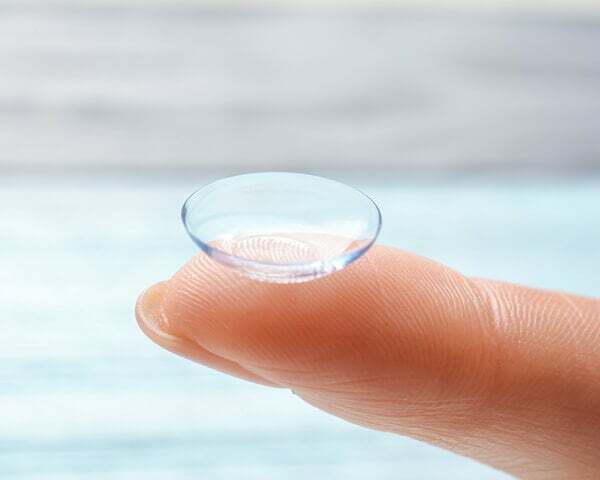 Regular, spherical contact lenses probably won't fit your eyes well and you might find that they move around, leading to inconsistent or poor vision as well as discomfort. Toric lenses are designed to fit your eyes securely and comfortably, ensuring crisp, consistent vision for the entire day. If you picture a spherical lens as being shaped like a slice taken out of a glass ball, a toric lens is like a slice taken from a ring doughnut and so has an uneven surface that allows it to perfectly bend and focus light into your eye. Another feature of toric lenses is that they contain different powers for the various meridians in the eye. This means it can correct the amount of short or long sight in one part of the eye without affecting the rest. The toric lens design also makes sure that they stay in place and that the right corrective power sits over the relevant part of the eye. Some are weighted at the bottom so that they don't move around and cause blurry vision. When you're looking for contact lenses for astigmatism, it's easy to get a little bit confused. A lot of the most popular brands have toric versions with a similar name so it's important to double check that the title on the webpage or the lens box says either 'toric' or 'for astigmatism' somewhere on it. If you see this, you're sure to have the right type of lenses. Remember, as we outlined above, astigmatism is a condition that is unique to each person. This means that not every type of toric contact lens is going to be perfect for you. It's often advisable to stick to the brand or manufacturer that your optician has recommended for you to ensure that you get the best lenses for your needs. If you've been recommended a toric lens that is an opticians' own brand and can't find it online, you needn't worry. Boots and Specsavers lenses are the equivalents of other branded contact lenses, but with different packaging. To find the equivalent lens to Boots own brand look at this table, and for Specsavers easyvision, you can use this table to find the right lens. When choosing a toric contact lens you will be asked to enter the power and sometimes the diameter and base curve from your prescription, as you would with a spherical lens. You will also be asked to enter the cylinder (CYL) and the axis (AX), two measurements unique to contact lenses for astigmatism. The cylinder indicates how pronounced your astigmatism is, while the axis determines what angle the correction is needed to be at to provide clear vision. If you have dry eyes it's worth choosing a lens that either has a high water content or is particularly adept at retaining moisture. You should also see if the lens is particularly breathable and lets plenty of oxygen reach the eye to guarantee that your eyes will be comfortable throughout the day. Other features you might want to check for are additional UV blocking and a handling tint for easy application. You can buy toric contact lenses with a choice of 3 different wearing patterns. 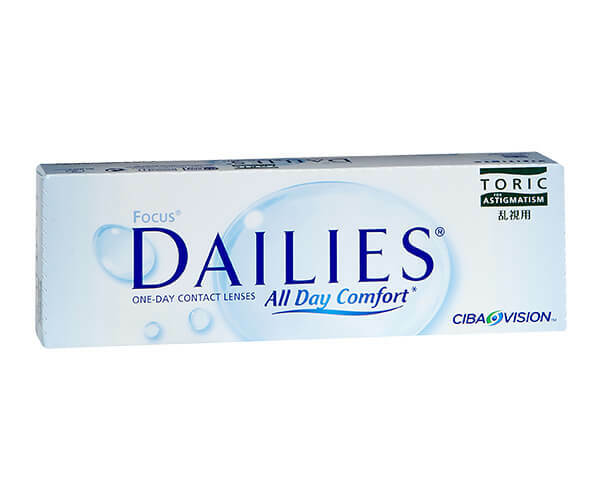 Daily toric contact lenses: These lenses are to be worn for a day before being disposed of and replaced the next day. They offer the highest level of hygiene in a contact lens and require no cleaning so are ideal of your looking for a convenient and comfortable lens. Examples include 1-day Acuvue Moist for Astigmatism and Dailies AquaComfort Plus Toric. Monthly toric contact lenses: You can wear these lenses for 30 consecutive days, provided you clean and store them in solution each night. 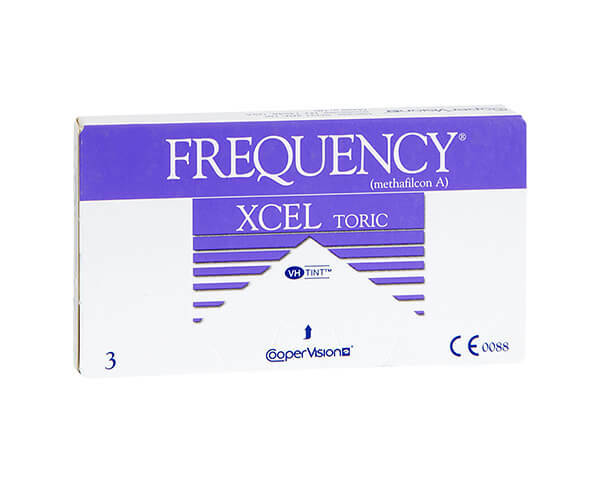 One of the great advantages of monthly toric lenses is that they offer excellent value for money, with one box getting you through at least 3 months per eye. Examples include Air Optix for Astigmatism and Proclear Toric. 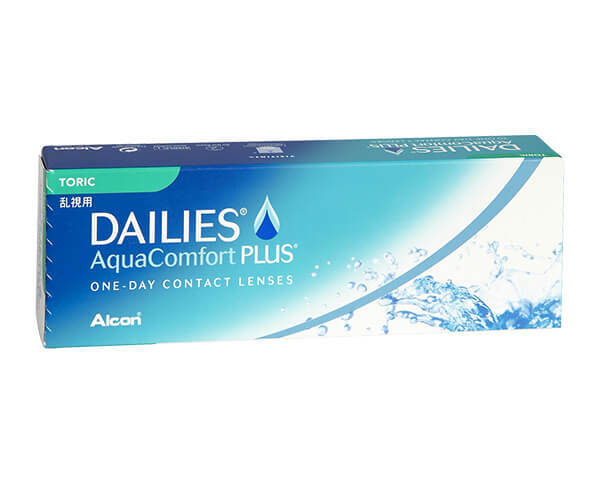 Two-weekly toric contact lenses: Two-weekly toric lenses offer a good middle ground between monthlies and dailies, still offering good value for money but also less of a wait to replace them. This means fresher-feeling lenses, without having to pay as much as you do for dailies. 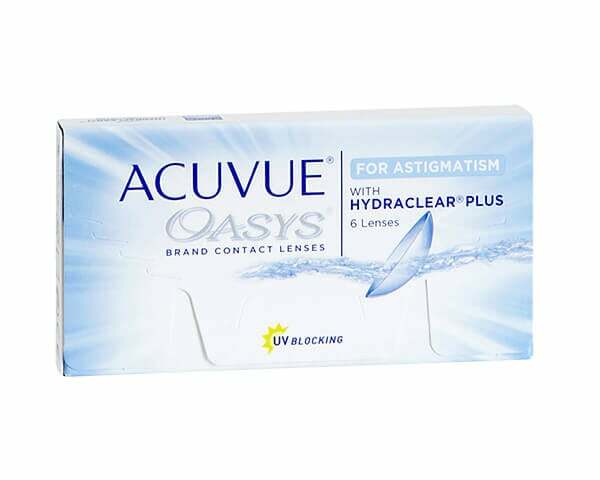 Examples include Acuvue Oasys for Astigmatism and SofLens Toric. These convenient daily lenses use LACREON® technology to create a moisture cushion for extra comfort. 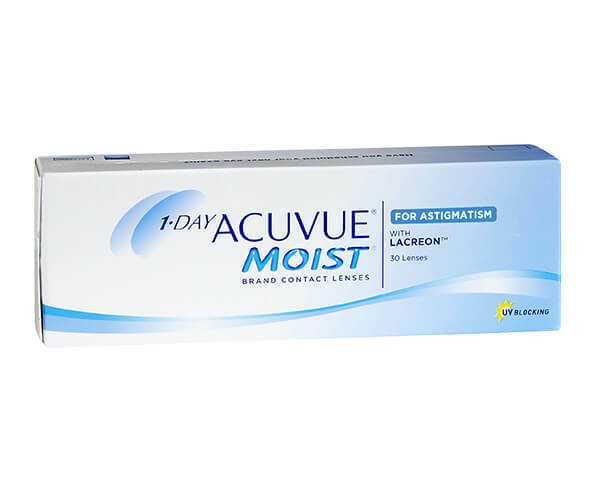 1 -Day Acuvue Moist for Astigmatism also have a UV blocking filter for an extra layer of defence from sun damage and a 1-2-3 indicator for easy application. As two-weekly lenses, Acuvue Oasys offer you the chance to replace your lenses while providing great value for money. Suitable for dry or sensitive eyes, they also include a UV filter for added protection from the sun along with an Accelerated Stabilisation Design to ensure clear and consistent vision all day. 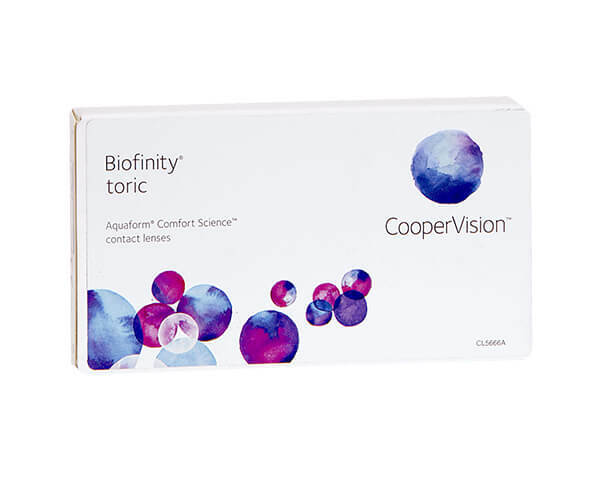 Biofinity Toric are monthly lenses so offer great value for money. They use Aquaform® technology to soothe dry eyes and are naturally moist for fresh-feeling comfort even in dry or air-conditioned environments. Dailies AquaComfort Plus offer the highest levels of convenience and hygiene along with blink-activation technology to release moisture gradually with each blink. They're made with Lightstream Technology™ for a smooth surface that resists protein build ups, with a handling tint that helps to make applying your contact lenses easy. Made from light, flexible material that fits comfortably, Focus Dailies Toric are daily lenses that provide hygienic and healthy vision. They're convenient and easy to apply, with a handling tint to assist you and blink-activation technology to keep your eyes hydrated over the course of the day. 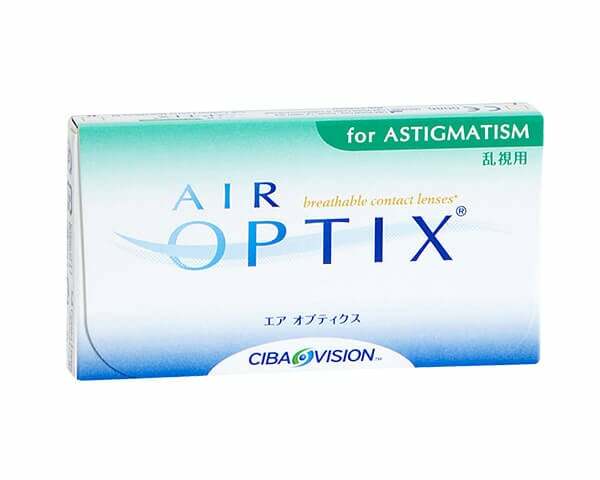 Air Optix for Astigmatism are monthly lenses that provide 30 consecutive days of wear. These lenses use TriComfort™ technology for healthy and comfortable eyes and are made from a material that is ultra-breathable and retains a large amount of moisture meaning that they can be worn for up to 16 hours a day. 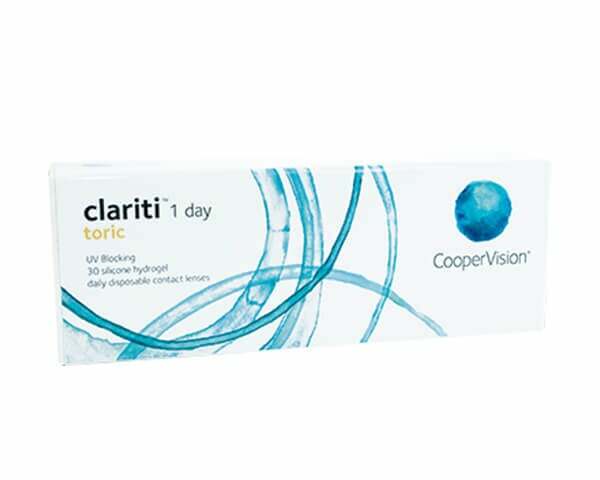 As one of the only daily toric lenses that are made from silicone hydrogel available today, Clariti 1 Day Toric are flexible and comfortable lenses to wear. Using WetLoc™ technology to retain moisture they are also an excellent choice if you suffer from dry eyes and have a built-in UV blocking filter for an extra layer of protection against sun damage. 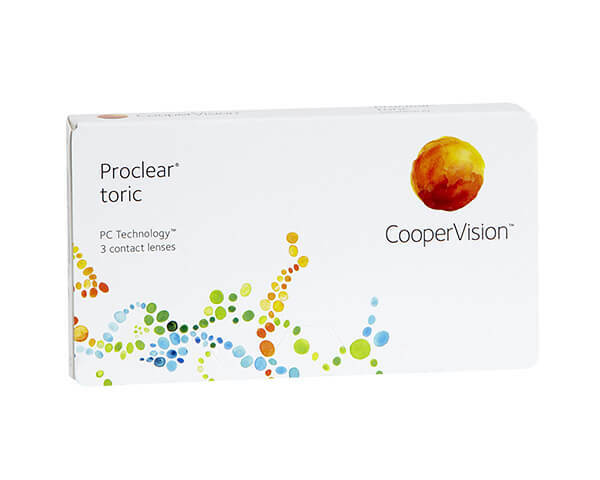 With an optimised lens shape that fits your eye securely, Proclear Toric are a comfortable and great value monthly option. Using CooperVision's PC Technology™ these are great lenses to wear for a natural-feeling experience. Using UltraSync® Technology for a perfectly stable lens, Frequency Xcel Toric offer consistently perfect vision for the entire day. Made with a high water content, these lenses are ideal if you suffer from dry eyes and have a handling tint to make applying them easier.